Buy this book!!!!!!!!!! New Zeal is extensively referenced. American journalist, author and radio host, Aaron Klein, along with historian and researcher, Brenda J. Elliott blow the lid off the dome of silence surrounding the Obama administration as they boldly unmask the nation’s 44th president in their latest chilling monograph entitled. 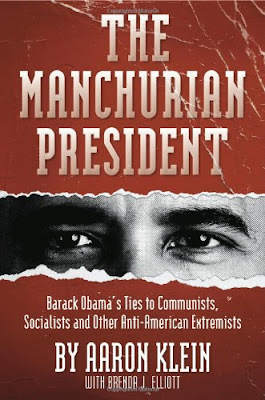 “The Manchurian President: Barack Obama’s Ties to Communists, Socialists and Other Anti-American Extremists” (WND Books – May 2010). Providing close to 900 footnotes and countless pages of documentation they reveal surreptitious ties to radical leftists of all stripes. If the title of this book sounds at all familiar, it is a takeoff on the 1959 political thriller novel by Robert Condon called “The Manchurian Candidate” in which the son of a prominent US political family has been brainwashed into being an unwitting assassin for the Communist party. While Klein does not infer that President Obama is part of a Communist sleeper cell, he does present an exhaustive investigation into President Obama’s background and his radical ties to pivotal figures in the Communist movement, both inside the White House and out who also happen to be major players in crafting legislation, including the economic stimulus package. This weighty tome weaves a complex spider’s web of a narrative that is replete with a plethora of names and organizations of radical leftists, hitherto unknown by the public who helped shape Obama’s ideology and career. Klein informs us that Obama worked directly with Ayers in Chicago back in 1988, after Ayers resurfaced from his underground status amid multiple criminal charges related to his extremist activities. The charges were dropped due to prosecutorial misconduct. The two were introduced by Gerald “Jerry” Kellman, a Marxist acolyte of radical community organizer Saul Alinsky, and thus, a professional association was forged as Obama served with the Ayers’ run community advocacy coalition called the Alliance for Better Chicago Schools, or ABC. When Obama launched his political career in 1995, the venue for his first fundraiser was the Chicago apartment of Bill Ayers and the two served alongside each other from 1995 to 2000 on a $100 million education foundation called the Chicago Annenberg Challenge or CAC. Obama’s associations with the Nation of Islam, Black Liberation Theology and black political extremists are also revealed in nuanced detail, as Klein reveals that Obama attended the million man march organized by Nation of Islam leader and rabid Jew hater, Louis Farrakhan. For over 20 years Obama attended the Trinity United Church of Christ in Chicago where Farrakhan gave guest lectures at the behest of anti-American extremist preacher Rev. Jeremiah Wright. Klein also uncovers the fact that the Nation of Islam was on Obama’s payroll in the early days of his political career and that his senior advisor, David Axelrod also maintained ties to radical Islam through his association as a board member of St. Sabena’s Church in Chicago which served as a haven for black nationalists of the Nation of Islam variety. “The Manchurian President” also exposes how Obama’s health-care policy, masked by moderate populist rhetoric, was pushed along and partially crafted by extremists. Some of them reveal in their own words that their principal aim is to achieve corporate socialist goals and a vast increase in government powers. This meticulously documented piece of outstanding investigative research is a must read for all good citizens of this great country who are concerned with the future of our cherished freedoms and values. This is all great info, BUT how do we get this guy out of the WH? And where was all this data when the man was running? I finished this last week. It was very thorough with information I hadn't seen before. Good for NewZeal on many well deserved credits throughout!